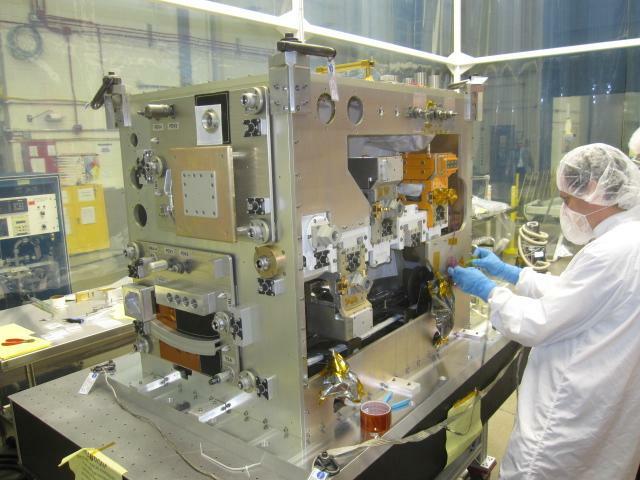 The main internal panel on the previous page is joined by the outer panels to form the RRM enclosure. Once enough of the structure is present, we can start our system level tests, and the first of which is the Electro-Magnetic Compatibility (EMC) tests. In the EMC test, we verify the tolerance of our system to radio interference, and that we do not produce harmful interference ourselves. 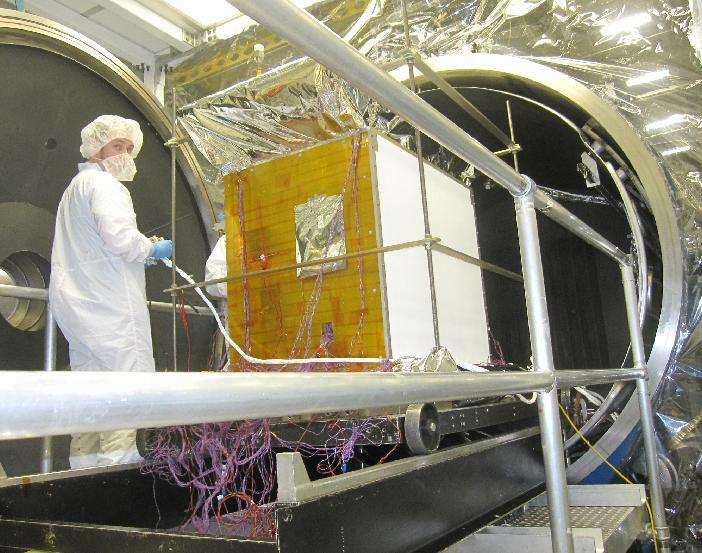 This test occurs in the 'screen room' at Goddard Space Flight Center. This room is shielded to prevent intrusion of outside sources. Example of the antennas that are used to detect any radiation given off by our hardware. 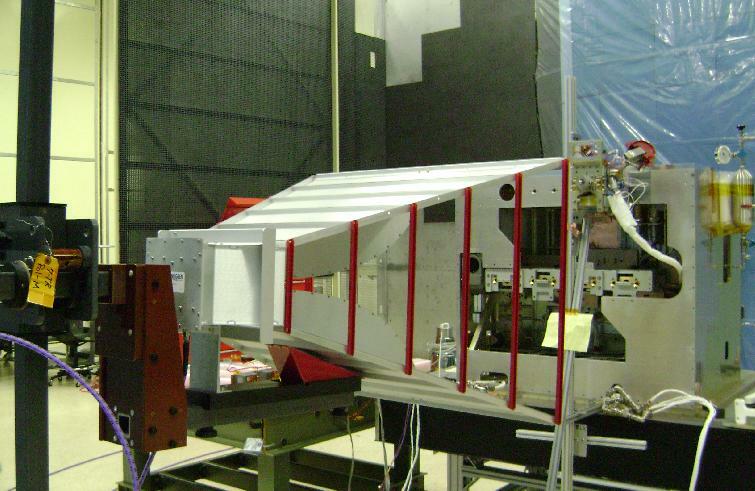 After EMC testing, we continued to build up our system to transition to vibration testing. This is where we shake the hardware to verify it is strong enough to widthstand the stresses of launch on the Space Shuttle. 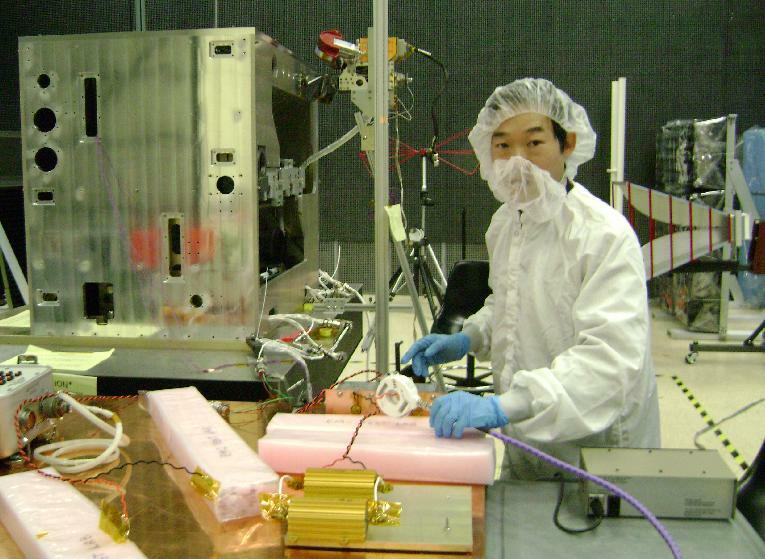 After the EMI test, we prepared for the vibration test (January 2011). 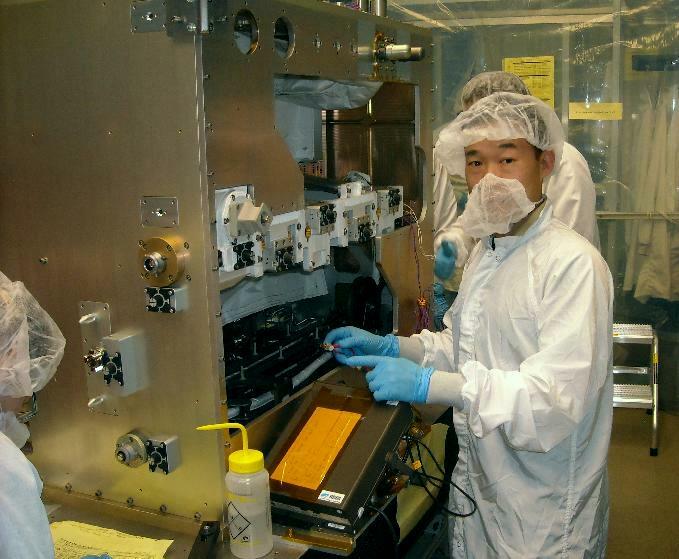 In the image above, Kelvin is working on the 'front' panel. This is the one that the robot will face to interact with the tools. Each tool has a target, which is the small black cone on each tool. 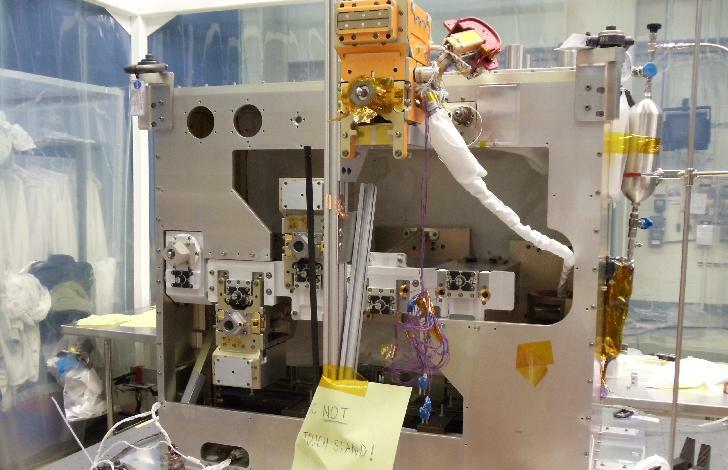 Our system will have four tools, arranged in the middle of the panel on a row (the right most one and is covered with orange tape at this stage) . The top part of this orange tool is the Tool Electronics Box, which was shown in tests on the previous page. On the left panel (called the 'outboard' panel), there are two smaller panels called 'task boards'. 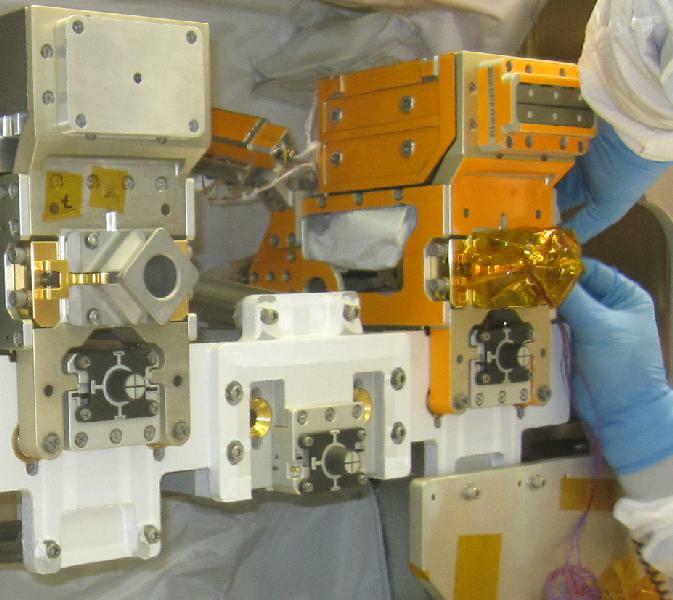 These contain various features and gadgets that will be used to evaluate robot tasks once we are on the International Space Station. 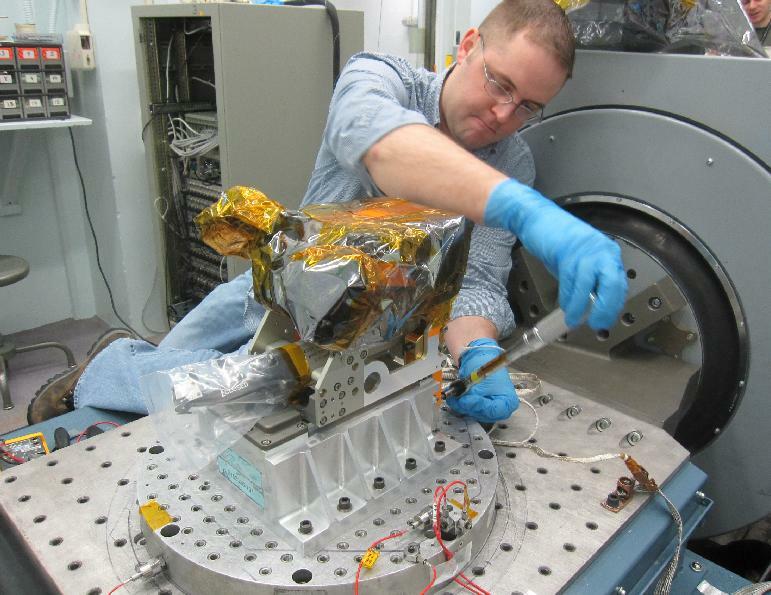 These tasks include other valves, connectors, and other satellite parts. middle one in this image has not been installed yet. The robot picks up each tool by centering on the black cone target. Once lined up, it closes its gripper jaws, and that causes it to close on the square-shaped handle. By doing this, it also squeezes on the gold colored tabs on the base of the handle, which release the tool from the stowage system. with the target, and the Gripper Jaws holds the diamond-shaped tool handle. Electronics Box. For more on the robot, see here. 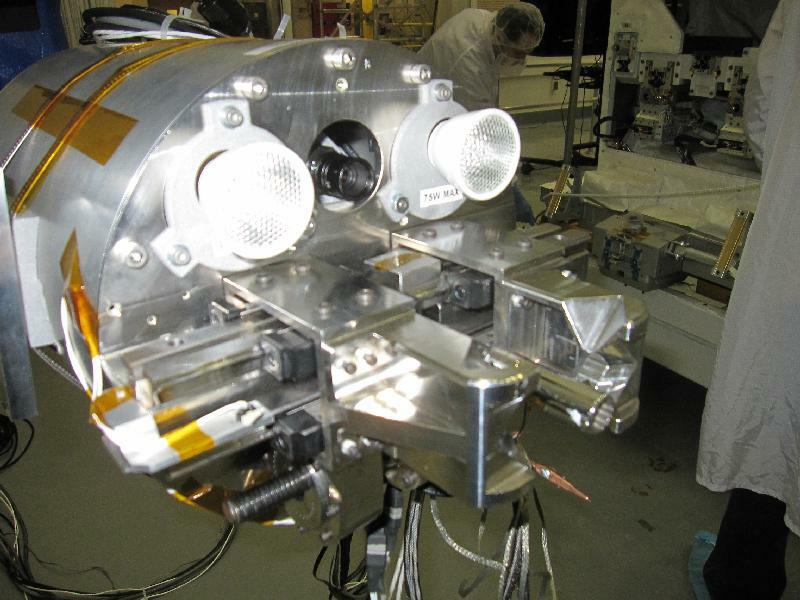 As mentioned before, the purpose of this project is to demonstrate fuel refill capability by robotic means. 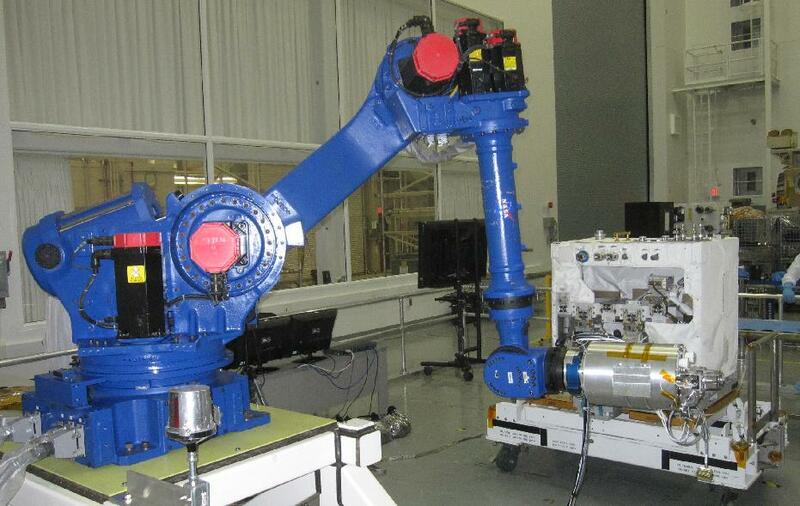 There are two valves near the top edge of the RRM unit, and the robot uses the tools one at a time to uncap the valve and to prepare it for the refilling operation. Beta cloth blanket for thermal protection. Making some grounding measurements with the milli Ohm meter. generate a very loud sound level. 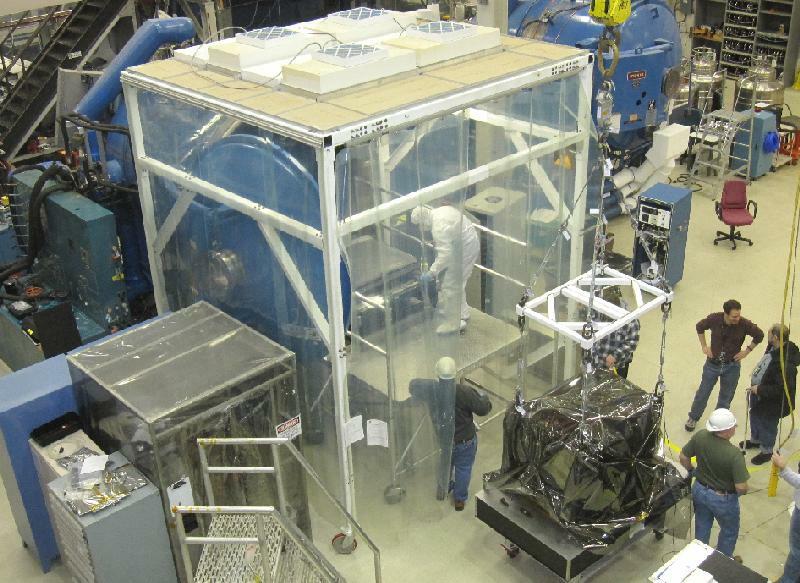 After the vibe test we craned the system into one of the front loading thermal-vacuum chambers to verify that our system can work in the temperature extremes and vacuum of space. One can see the big blue steel door of the chamber inside the clean tent. With Colin Vogel, who is doing the final electrical checks before we perform a functional test of the hardware in the chamber. The backpanel of the RRM is a white radiator, and it has been installed for this test. 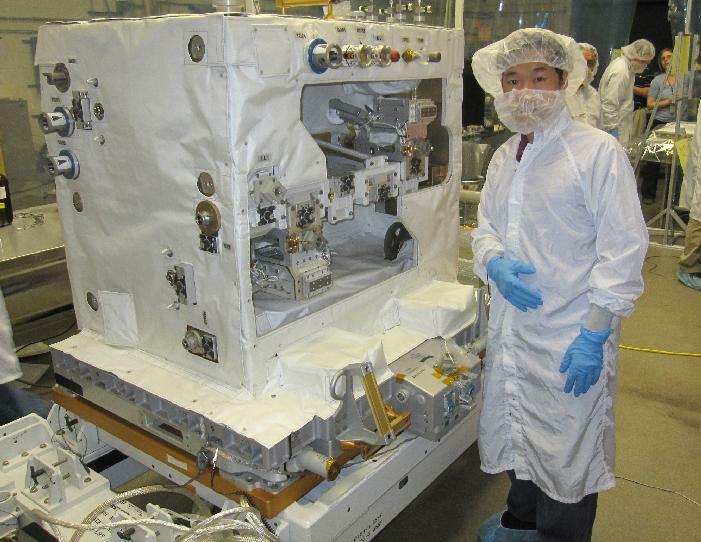 In our first test at vacuum and cold (Jan '11), we found out that there was a problem with our electrically operated valves, and they were leaking the ethanol fuel. 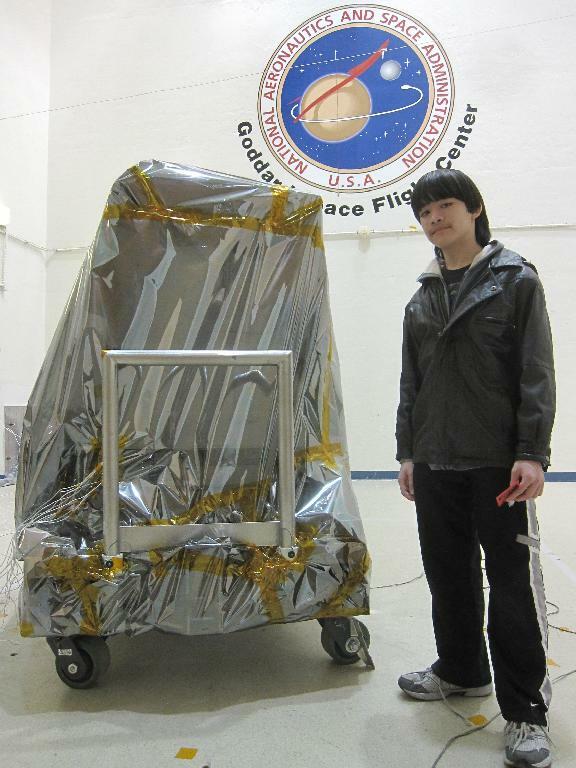 This discovery is an important reason we test our hardware under real flight conditions. The leak occurred when the temperature was about -5C. Although it cost us several days of schedule, our team pulled together, and we found valves from Valvetech that had Teflon seals. These are rated for about -50C, and that exceeds the required temperature region. 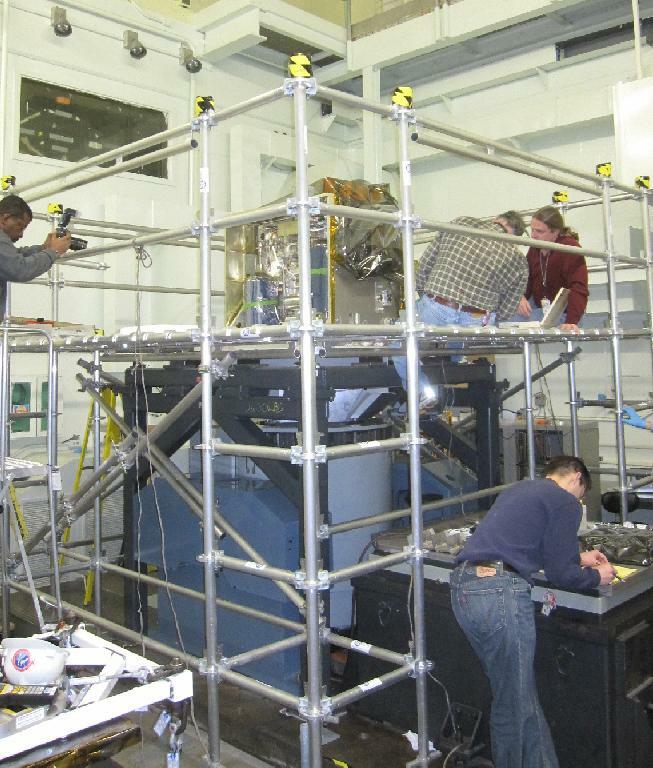 We resumed our thermal-vacuum test in early February 2011. This time, we had no leaks, and were able to complete the test successfully. 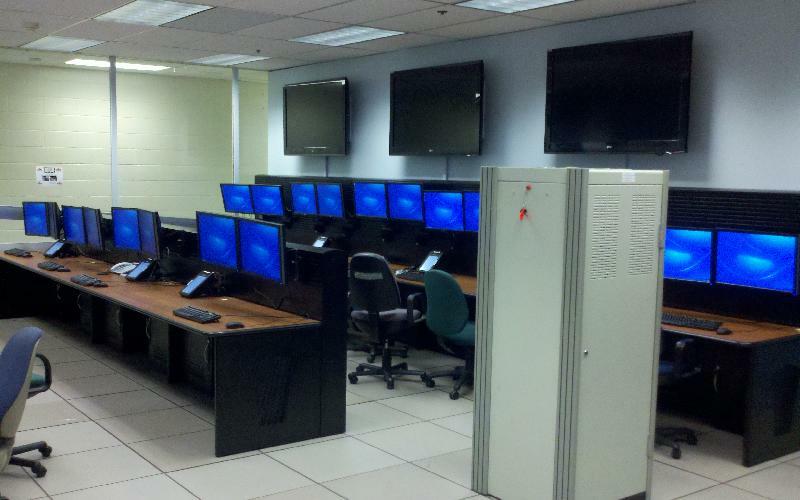 As we near the time for mission training, our main control center (GSSCC - Goddard Satellite Servicing Control Center) is being readied. The room has a large visitor window on the left. My console, the Electrical position will be on the front row, second from the left. Click here for a pano view. 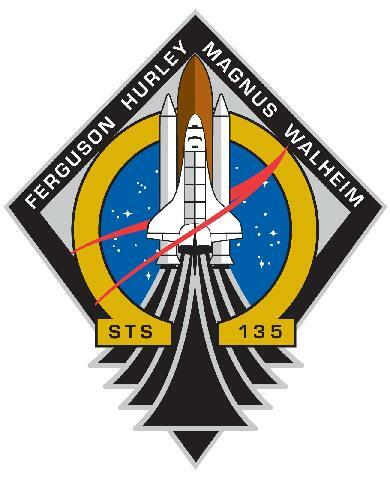 It is at this time (February 2011) that the logo for STS-135 is revealed. name on the Orbiter to honor all of the vehicles. from the temperature extremes of space. 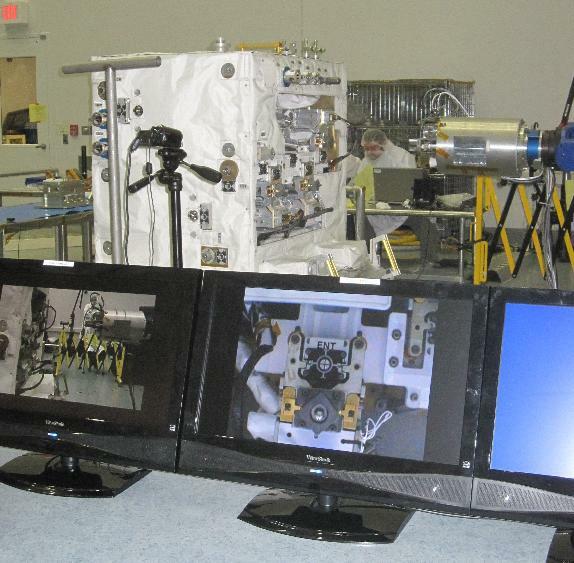 The RRM system is now ready for travel into space. Tool, that will be used to cut the wire that holds the valves shut, onto the vibration table. concrete walls and huge speakers to produce the loud sound. 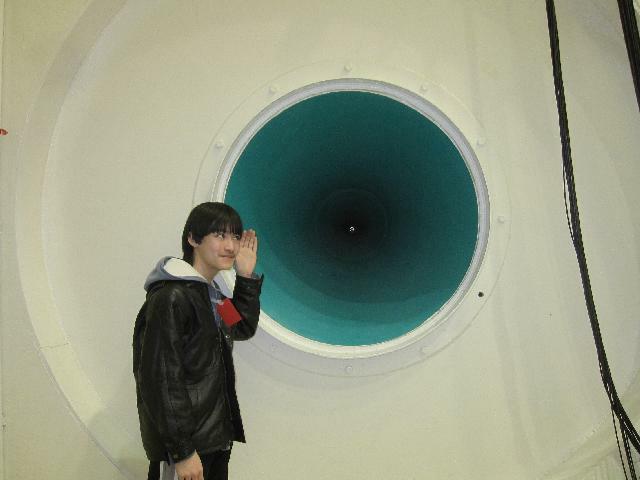 This is Christopher by one of the big speakers that produce the acoustic chamber's test sound. perform the operations as we would while on Space Station. Note this is the robot I purchased for this work. A close-up of the gripper of the ground robot. 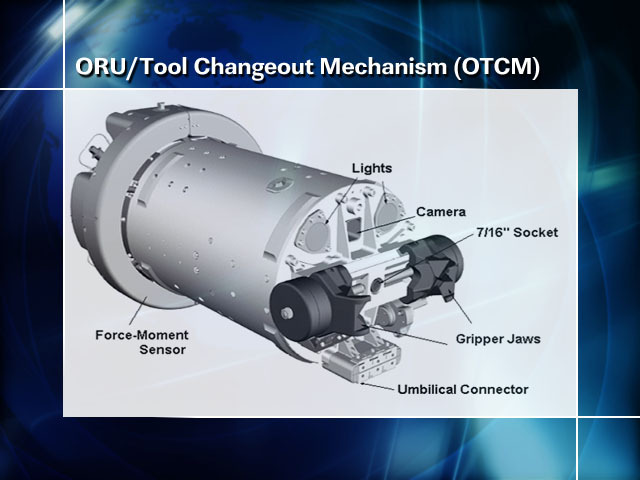 This OTCM simulator is very close to the space version. on the diamond square below it.